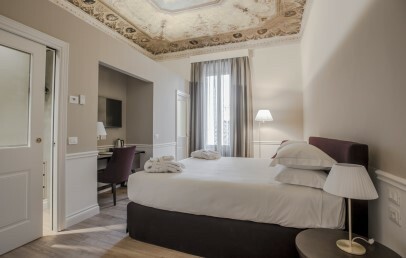 Palazzo Castri 1874 for couples looking for a romantic hideaway and for anyone looking for a relaxing break in one of the most beautiful cities in the world. Palazzo Castri 1874 was born of the restauration of a historical building in the heart of Florence. The hotel is located a pleasant walk from the city centre’s main attractions and at the same time is an oasis of tranquillity and silence. The hotel is 7 km from airport Florence-Peretola and just 500 m from train station Santa Maria Novella. Palazzo Castri 1874 is a welcoming boutique hotel in the centre of Florence, a gem of Italian hospitality offering an attentive and personalised service. The unique style of the indoor areas is the fruit of a sophisticated merger of classic and modern elements that combine to create a warm and refined setting. The particularity of the hotel is the 1000 sq.m. Limonaia Garden, a beautiful garden, designed to provide guests with moments of regenerating silence. The 59 rooms at Palazzo Castri 1874 are welcoming and silent havens overlooking the garden or providing spectacular views of Florence Cathedral and Giotto bell tower. 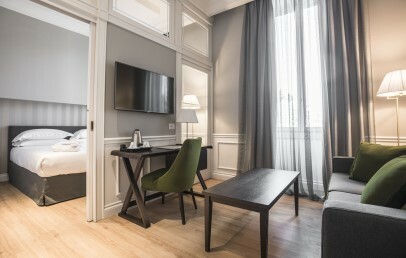 Furnished with style and character, all rooms offer a W-Fi connection, a complimentary Dr Vranjes Firenze lemon essence toiletries set, and everything guests need to prepare tea and coffee in the comfort of their own room. Standard – 17-20 sq.m., double bed or twin beds, en-suite bathroom with shower. 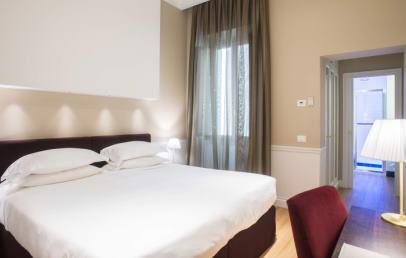 Classic – 16-20 sq.m., double bed or twin beds, en-suite bathroom with shower, city view. 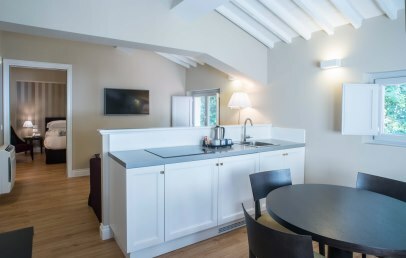 Superior – 16-25 sq.m., double bed or twin beds, en-suite bathroom with shower, view of the La Limonaia garden or a private terrace overlooking the garden or the Cathedral of Santa Maria del Fiore. 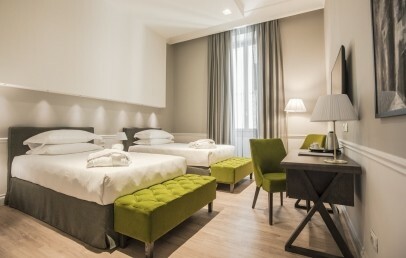 Junior Suite – 25-30 sq.m., double bed, small living room, en-suite bathroom with shower, city view. 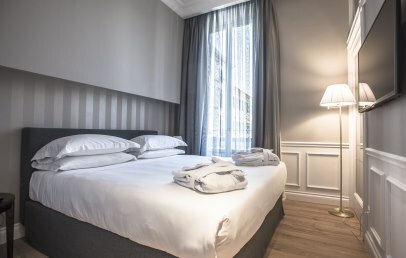 Junior Suite with View – 25-30 sq.m., double bed, small living room, en-suite bathroom with shower, view of the La Limonaia garden. Brunelleschi Suite – 25 sq.m., double bed, en-suite bathroom with shower, cathedral view. Exclusive Suite – 50 sq.m., double bed, en-suite bathroom with shower, private terrace overlooking the garden. A spectacular oasis of wellbeing reserved for hotel guests, the spa offers: a Finnish sauna and Hamman, a relaxation area with La via del tè di Firenze 1961 infusions, a small gym with Technogym equipment and a hydro-massage pool that continues outdoors into the La Limonaia garden. Various treatments are to choose of the spa menu: massages and Maria Galland facial and body treatments. The access to the wellness centre and gym is included in the room price (not included for guests staying in Standard rooms). A day at Palazzo Castri 1871 always starts with a rich buffet breakfast of homemade bakery products, and local cold cuts and cheeses accompanied by artisan bread. The arrival of spring will bring the possibility of enjoying meals and cocktails prepared by the Florentia Café in the relaxing tranquillity of the Limonaia garden. Included in the room rate are the use of the hotel’s common areas, breakfast, access to the wellness centre and gym (not included for guests staying in Standard rooms), unlimited use of the Wi-Fi connection. Beauty treatments and bar services are subject to additional charges. Welcoming double rooms with a double bed or twin beds, an elegant and essential style, and en-suite bathroom with shower. 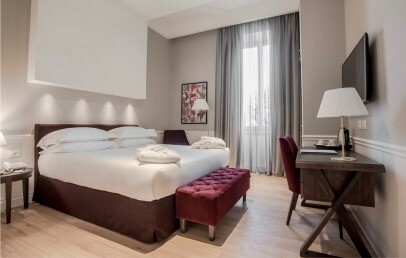 Classic rooms overlook Piazza Indipendenza and are ideal for a couples’ getaway or business trip. 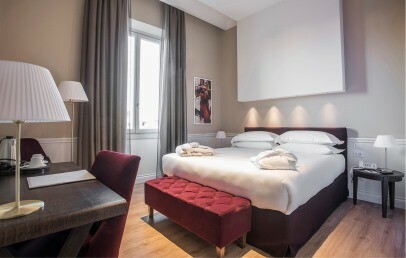 Elegant double rooms with either a double bed and views of the La Limonaia garden and the Cathedral, or twin beds and views of Piazza Indipendenza. One superior room with double bed and private terrace giving onto the garden offers a beautiful frescoed ceiling. All superior rooms have an en-suite bathroom with shower. Exclusive and comfortable rooms, junior suites are split into a night area with double bed and a separate day area with a small living room and sofa. 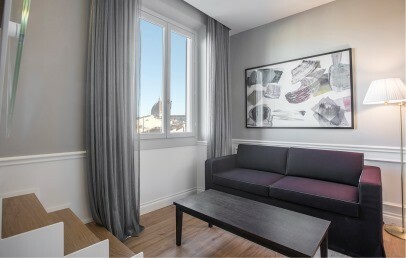 Junior suites offer views over Piazza Indipendenza. All rooms have an en-suite bathroom with shower. 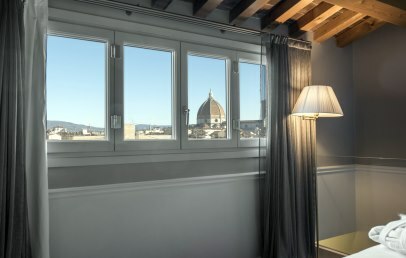 The Brunelleschi Suite is the hotel’s most romantic room with spectacular views over the Cathedral of Santa Maria del Fiore. The suite is split into a welcoming living room and an elegant loft bedroom reached by an internal staircase. 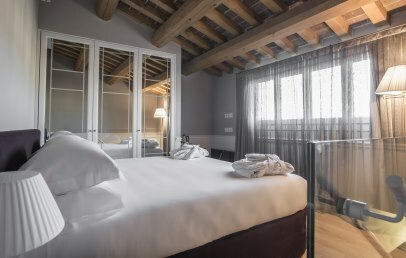 The room has a ceiling with exposed beams and a large window overlooking the rooftops of Florence. Large spaces and total privacy, the Exclusive Suite is a 50 sq.m. annex set deep in the gardens, reached along a charming path through the greenery. The room offers two double bedrooms, two bathrooms, a small living room and a kitchenette. Welcoming double rooms with a double bed or twin beds, an elegant and essential style, and en-suite bathroom with shower. Exclusive and comfortable rooms, junior suites are split into a night area with double bed and a separate day area with a small living room and sofa. 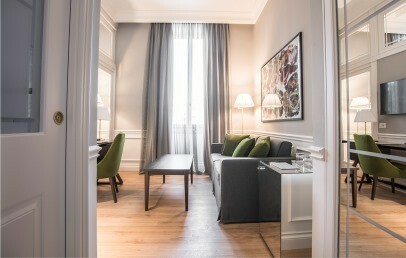 Junior suites offer views over the La Limonaia garden. All rooms have an en-suite bathroom with shower.